The United Nations calls for a ceasefire. Military sources (and a video) confirm air strikes. A power struggle between the military leadership and Thein Sein's reformist administration underlies the crisis. Sources tell AsiaNews that communities could be isolated by the destruction of bridges and roads. Yangon (AsiaNews) - The United Nations has called on the Burmese government to accept a ceasefire in the northern state of Kachin on the border of China. 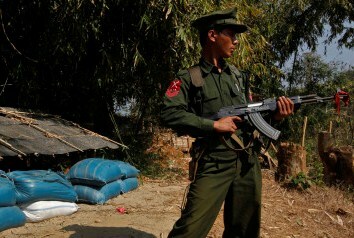 At present, regular Myanmar army troops are fighting rebels from the Kachin Independence Army (KIA). Contrary to previous reassuring statements coming from the capital Naypyidaw, military sources recently admitted that it had launched an offensive, including air strikes and aerial bombing, confirming what Burmese sources told AsiaNews. For some Burma experts, the escalation is due to a split within the country's top leadership: the civilianised pro-reform government and the military are divided with the latter bent on using an iron fist against dissidents, opponents and rebels. Until recently, a military junta ran the country. UN Secretary General Ban Ki-moon spoke out yesterday, calling on the Myanmar military to stop its air strikes against Kachin rebels and seek instead a permanent solution to the conflict. The United States Department of State made a similar plea, concerned about the use of air power. Local sources said that war operations have intensified in the region, with fighter planes carrying out strikes. Citing top military officers, Myanmar state TV confirmed the escalation, contradicting earlier statements by the civilian government, which has so far denied the use of plates. At present, the military appears to be trying to resupply Laja Yang base, which is not far from KIA's headquarters in Laiza, which was recently bombed (see here). KIA spokesman La Nan said that supplies to Myanmar troops include ammunitions and weapons used against Kachin rebels. Anonymous local activists told AsiaNews that the two sides are in a hard-to-reach area, warning that military operations could wipe out entire communities. Local civilians could in fact be completely isolated and "divided as military operations blow up bridges, destroy roads and stop all other links." Kachin KIO, KIA's political arm, is the only "rebel" group that had not signed a peace deal with President Thein Sein and his "reformist" government, in power since March 2011. The latest wave of violence flared up in June 2011 after 17 years of relative calm. Since then 75,000 people have fled the area. The spark that re-ignited the conflict was the Kachin refusal to give up a strategic location near a hydro-electric plant under construction jointly by China and Myanmar. In light of the situation, if the central government in Naypyidaw wants to pursue its democratisation process on the long run, it must deal with the Kachin and their demands.